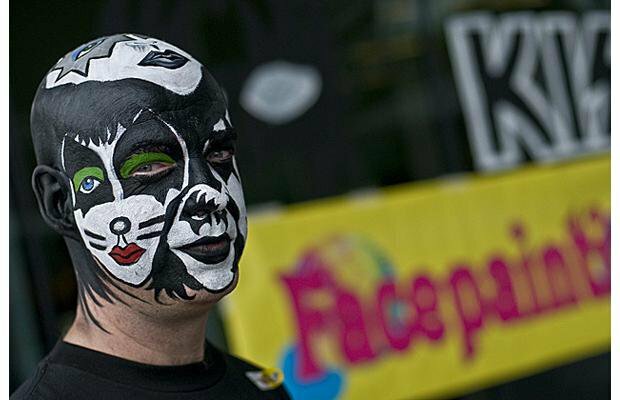 On our 11th anniversary, we went to our first ever Comic-Con. 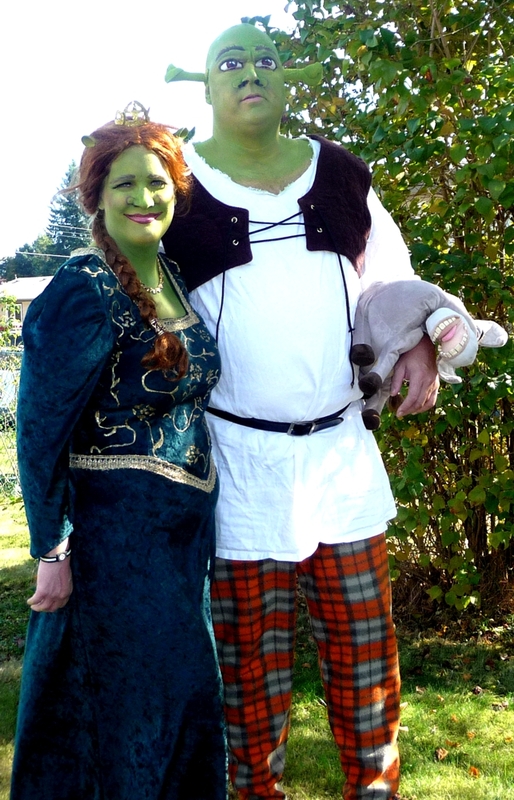 It took some manipulating, but I got my wonderful hubbie to put on the Shrek outfit I made him several years ago and I transformed into Fiona for the day. To give you a little perspective, I’m 5’10” and my husband is 6’10” and I’m pretty sure the writer’s of Shrek must have been fans of him back in his football days. There are too many similarities to just be coincidence. I don’t really fit the superhero body type, but I thought Shrek and Fiona would be a fun addition to Vancouver’s Mega Comic-Con. We’d arrived at the hotel hosting the event, and before we even got out of the underground parking, the security guard was wanting photos with us. He was a tall man and probably not had too many folks look down on him before. We made our way to the lobby where some Calgary Stampeders were assembled getting ready to play football against the BC Lions that evening. They saw Ray and wanted photos with him too. I went in search of a restroom and was followed by more fans that wanted photos with me too. And that’s how it was the entire time we were there. We should have charged a $1 a photo. We would have made a lot of money! Ray’s highlight was getting to visit with the wrestler ‘Honkeytonkman’. He actually did charge for photos, which we did so Ray could have a record of meeting one of his favourite wrestlers from back in the day. 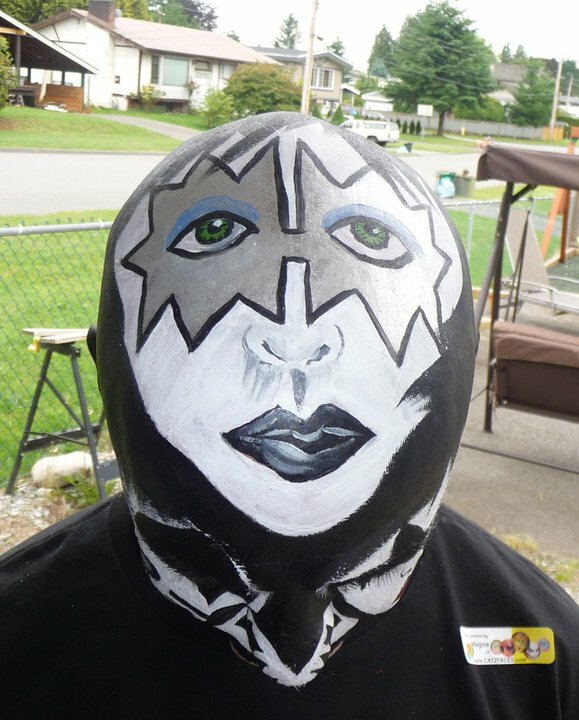 I was asked to paint concert goers when KISS came to Abbotsford back in 2011 at the Abbotsford Entertainment and Sports Centre. I knew it there was a concert to facepaint at, this would be the one. So I invited my friend Carolyn to bring her airbrush and help me with the crowds. What was supposed to only be 2 hours, turned into 4! 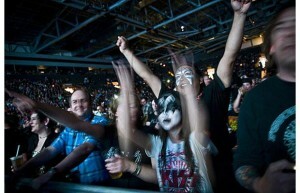 I was really impressed with the crowd too. I wasn’t sure what to expect as it’s not usually my type of music. My husband really likes them so I gave him my tickets and he said it was the best concert he’s ever been to. Really entertaining. 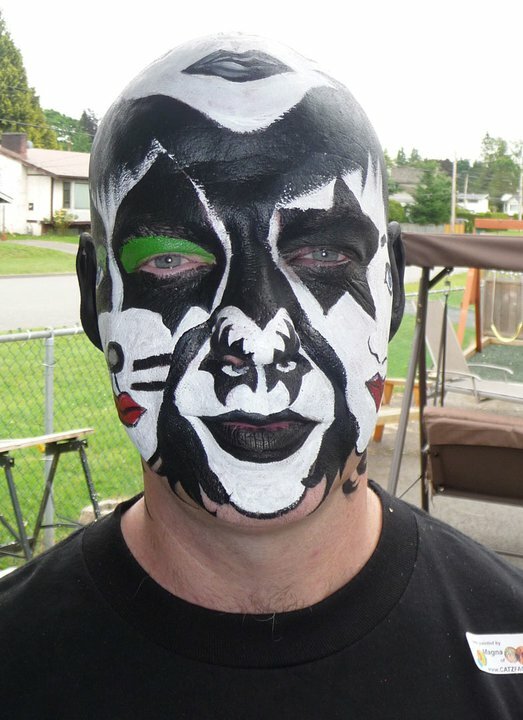 There were a lot of dads bringing their kids to their 1st concert. 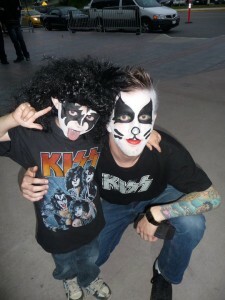 There was even a little guy (6 years old) with a wig that we painted up. He entertained us all during the pre-concert party singing KISS songs…he knew all the words! I arranged with one of my regular customers to paint him ahead of time as I wanted to try my hand at the design created by artist, James Kuhn. 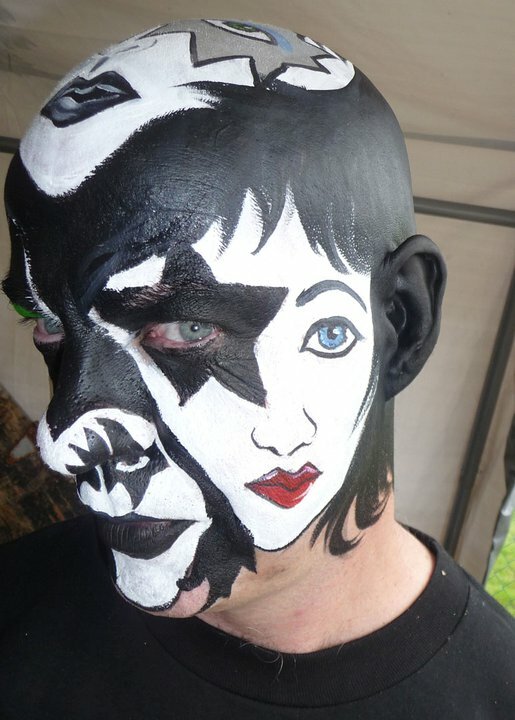 It’s all 4 KISS characters on one face. 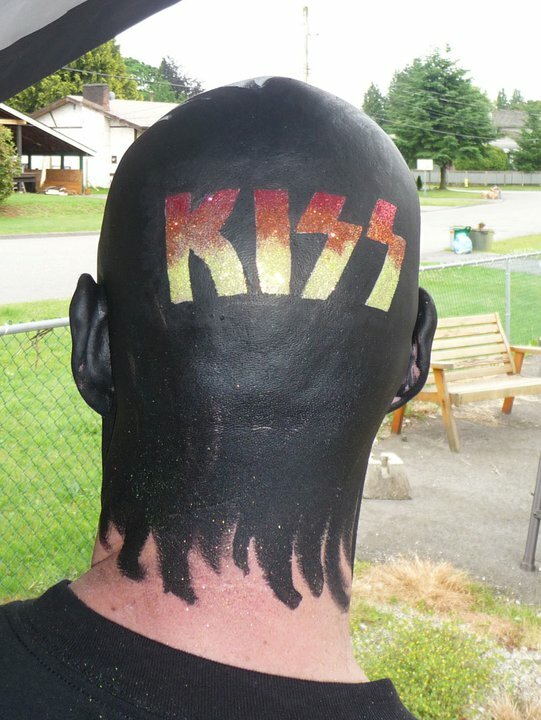 Then I gave him a glitter tattoo on the back of his head. It took 2 hours but it was worth it. 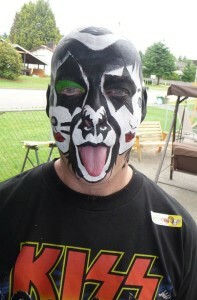 He looked awesome and everyone wanted photos of him at the concert. Someone told me they even saw it on the official KISS website too. Thank for being my willing model anytime Alan! Copyright © 2011 CATZfaces - Theme by Theme20 & Silviu Andrei.